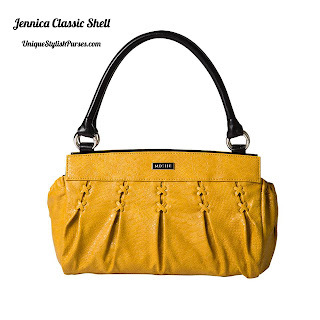 Jennica Classic Shell You’ll go wild for Jennica. Dijon yellow faux leather is given a little extra sass by a demi-gloss snakeskin pattern. Her pièce de résistance is the double row of criss-cross detailing along the top, crowning perfectly-placed pleats. Jennica turns a “great” neutral outfit into a “wow” neutral outfit! Matches our Interchangeable Handles Straps (yellow snake). End pockets.